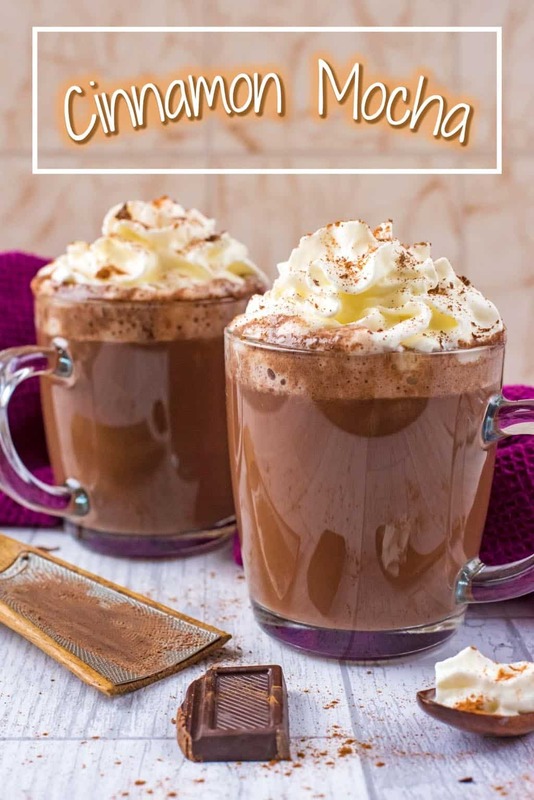 Who needs expensive coffee shops or fancy coffee machines when you can make a cup of this delicious Cinnamon Mocha at home in minutes? It’s like a hug in a mug and a lovely way to wake up someone special this weekend. This is the perfect ‘curl up on the sofa on a Sunday afternoon’ kind of hot drink, and whilst it doesn’t seem like Spring is going to make an appearance any time soon, we are still very much in a cosy hot drink vibe. As far as I am concerned, mochas are where it’s at when it comes to hot drinks. It’s what I always order in coffee shops, so we have been making our own at home to save on calories and money. 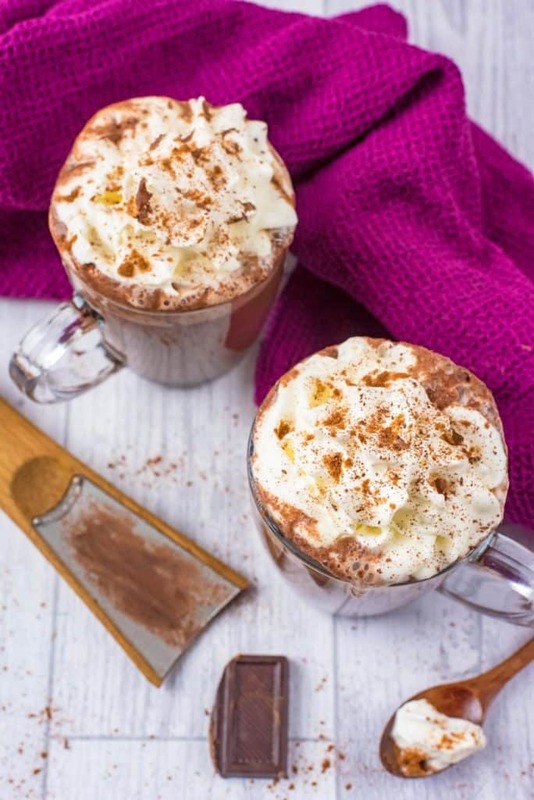 Do you want to be kept up to date on more delicious recipes like this Cinnamon Mocha? Please subscribe to the blog mailing list (it takes 30 seconds). You will get sent the new recipes straight to your inbox. Your email address won’t be passed on to anyone and you will never be spammed. Coffee is what keeps us functioning in life, and chocolate pretty much makes the world go round, so whoever thought to put them both together is pretty much a genius and deserves some kind of coffee making medal. I am sure there is an awards ceremony for that. It’s the perfect combination of bitter and sweet and you know what makes it even better? Cinnamon! Who says cinnamon is just for Christmas? Not us, that’s for sure! Coffee shops drinks are notoriously high in sugar and just one drink can seriously bump your calories up for the day (who wants to drink all their calories? Not us! ), so we have been keeping ours lower in sugar, but still with the right amount of sweetness by using Hermesetas Granulated. Sugar reduction is a hot topic and at the forefront of most people’s minds. It dominates the UK nutrition agenda, with the sugar tax introduction, Government reduction targets for food and drink companies and huge public awareness campaigns encouraging people to make sugar swaps for healthy options and a growing number of people are also adopting sugar-free diets. Whilst we aren’t telling you to go sugar-free (everything in moderation), making some sugar swaps can be a good thing. Did you know that a teenager’s sugar intake is triple the recommended limit?! Why not make a sugar swap in your family routine? Detailed in a new report, Sugar Switching: Sorting Fact From Fiction, the science shows that switching to low calorie sweeteners, like Hermesetas, not only provides people with a lower sugar diet option, but they also have an important role in relation to promoting weight management, good dental health and optimal blood sugar control. 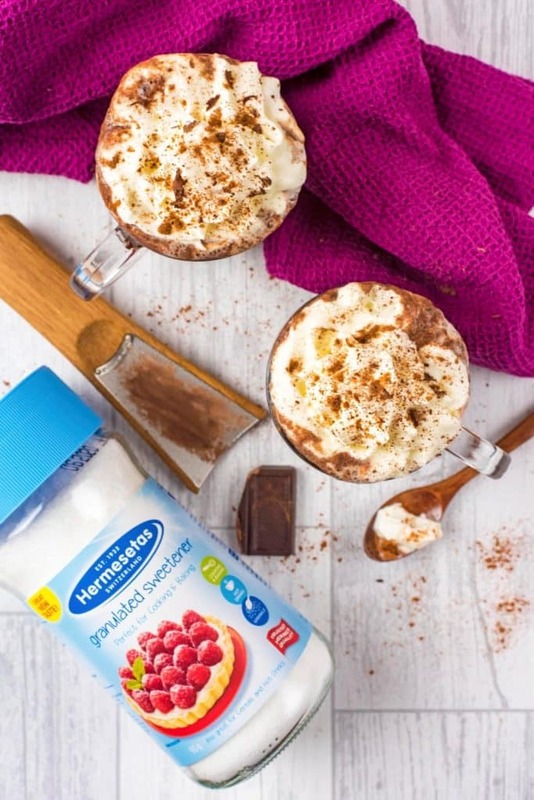 Using Hermesetas sweeteners instead of sugar in hot drinks could save 26,000 kcal over a year! What are sweeteners? 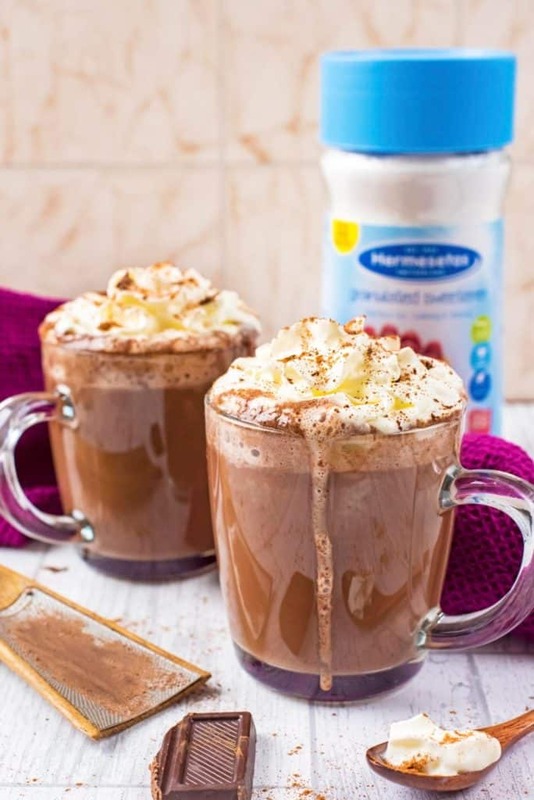 Sweeteners (Saccharin & Cyclamate in the Hermesetas Granulated) are classed as food ingredients, which means they are strictly regulated in Europe and given an ‘E number’ to show that they have been tested and approved for use. Research is used to determine an Acceptable Daily Intake (ADI) so that consumers stay well within safe limits. ADIs are the amount of sweetener that a person can consume daily for their lifetime without risking any health problems. Hermesetas also have mini sweeteners that are perfect for on the go and I always keep some in my bag, and a liquid sweetener that you could add to smoothies the same way you would honey. We used Hermesetas Granulated in this cinnamon mocha, as it is is heat stable. That makes it great for cooking and baking too, but equally good just sprinkled over fruit and cereal. It contains less than 2 calories per spoonful, which is 90% fewer calories than sugar per serving, meaning you can use 1/10 of your usual sugar in recipes. Head over to the Hermesetas website to see some more delicious recipes that it can be used in. You can change this mocha up every time and make something different. We like to swap the cinnamon out for some ground ginger instead, or do a chocolate orange combination with a little squeeze of orange juice and some zest. Love a chocolate mint combination? Add some peppermint extract in – that’s always a Christmas favourite in our house. 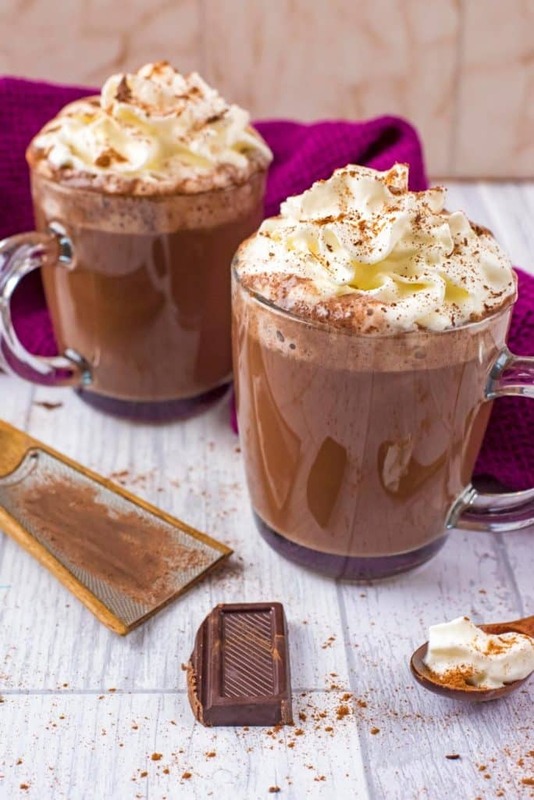 Who needs expensive coffee shops or fancy coffee machines when you can make a cup of this delicious Cinnamon Mocha at home in minutes. Add all the ingredients to a pan and whisk. Pour into two mugs and serve with whipped cream (optional). Do you fancy some other chocolate recipes? Try our Mint Chocolate Dessert, Chocolate and Banana Pinwheels or Chocolate Cupcakes. Yum! 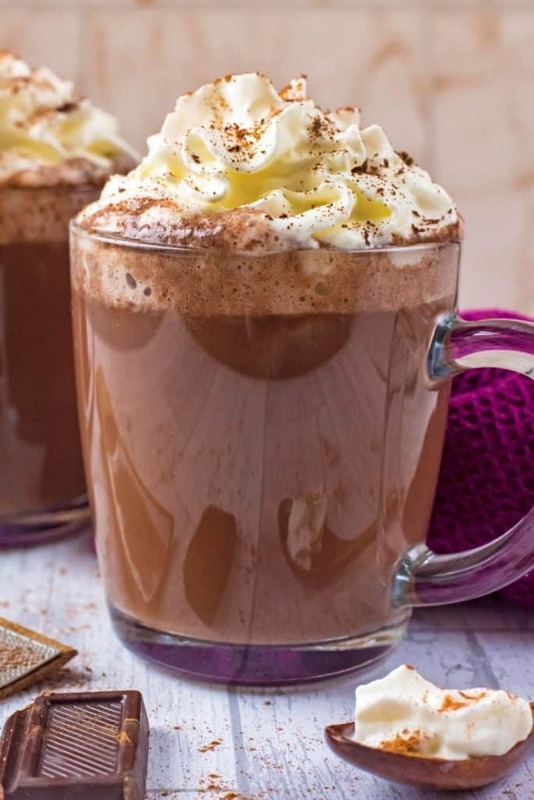 I think a little bit of cinnamon is divine in a mocha and your recipe looks scrumptious! I wish I could get that cinnamon mocha right out of that picture. Looks SO good. I am not a big fan of most nut milks and find them too thin for my taste. But cashew milk I have found it to be richer, especially there is one brand here in the US which I dont remember now, was pretty good. Coffee and chocolate are two of my favourite things! As you mentioned, coffee shop drinks are very high in calories, which is why I never order them when I am out. Thank you for this low calorie recipe I can try at home. 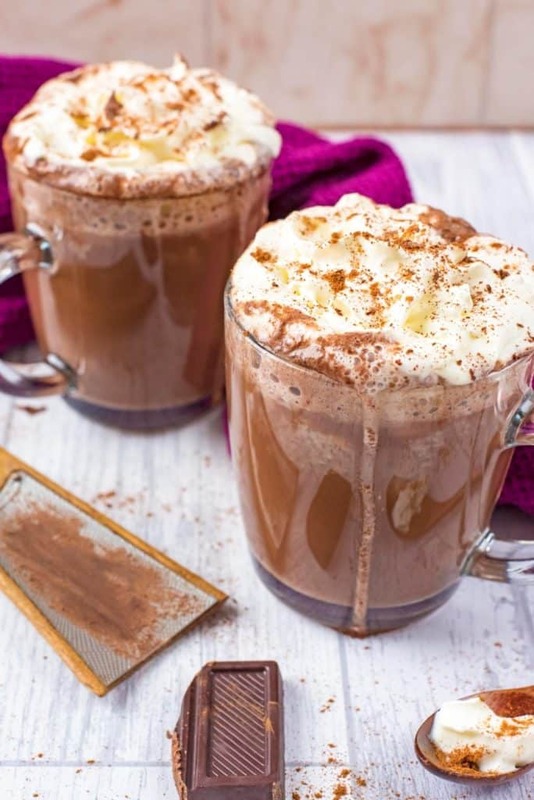 I love cinnamon drinks- this cinnamon mocha sounds amazing! I love a good curl up on the couch on a Sunday afternoon kind of beverage! I love the cinnamon in this – such a wonderful flavor for a warming beverage! Wow this recipe looks incredible and very tasty! I like that it can be cooked quickly and easily! This is one of my favorites! Thanks for the great recipe! I love making fun coffee drinks at home. Yours look wonderful. Plus I’m always looking for ways to lower sugar in my family’s diet. Sounds like a great product! What a great recipe for this weather! It’s still so cold in Switzerland, love to have some hot comfort drinks. And I do love that it’s made with cashew milk, which gives the whole a very tasty flavor. This looks so delicious! 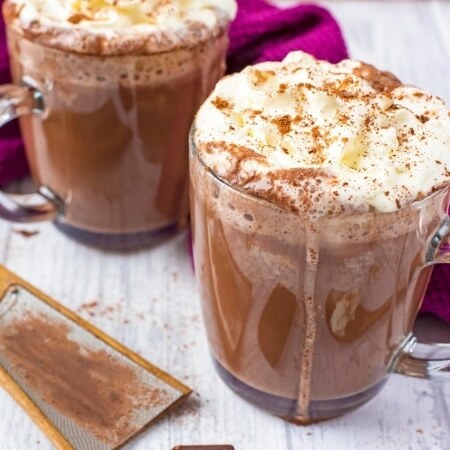 I’m in love with hot chocolate and love the addition of cinnamon! 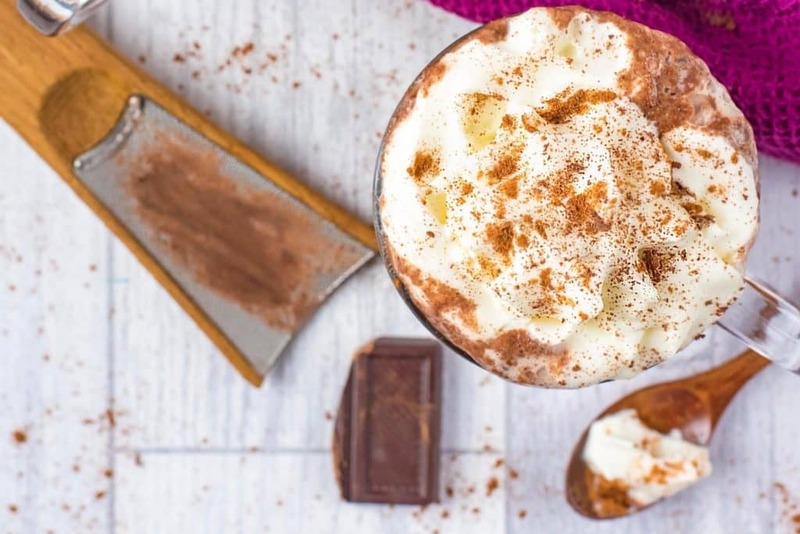 Chocolate and cinnamon mocha – you’ve ticked all the boxes. It’s quite chilly today and I’d love to be tucking into a mug of this (a hug in a mug as you say!). Great to learn a bit more about Hermesetas sweetener too! It always amazes me how much these drinks cost at coffee shops and I often prefer home made versions with yours showing us how easy and how tasty they can be when made at home. Just so delicious! THIS looks like heaven !! And I love that you used CASHEW milk! I absolutely love that frothy goodness on top! This looks so comforting and I love the idea of using a sweetener to cut down on the sugar content too.